Reference Point RP2: Carls Tip: Clearing Firefox's cache. Firefox can store parts of RPii program, so that it can load it faster. 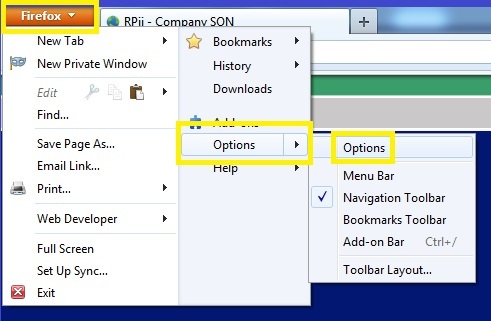 When using RPii, sometimes it helps to clear you cache so that the browser will get the latest version of the program. Close all sessions of Firefox, then open a fresh session. Click on the orange Firefox tab at the top left corner (unless you have the menu bar, then just go to tools and options), select History and then select Clear Recent History. Set the time range to Everything, select the details box to expand for more options, make sure everything is ticked and select Clear Now. 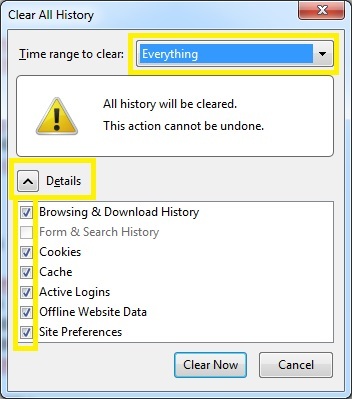 To get Firefox to clear the cache automatically when it closes. Close all sessions of Firefox, then open a fresh session. Click on the orange Firefox tab at the top left corner (unless you have the menu bar, then just go to tools and options), select Options, and then Options again. Select the Privacy tab at the top centre of the pop-up. Under the ‘Firefox will’ select Use Custom Settings for history. Tick the box for ‘Clear history when Firefox closes’ and select the Settings box. Tick all the options, and select OK. Then Select OK again. Close your session; this should then clear your cache automatically whenever you close Firefox. Any Questions on this, or if you have any other suggestions for a c ‘Carl Tip’ that other people would find useful, drop me a line on support.